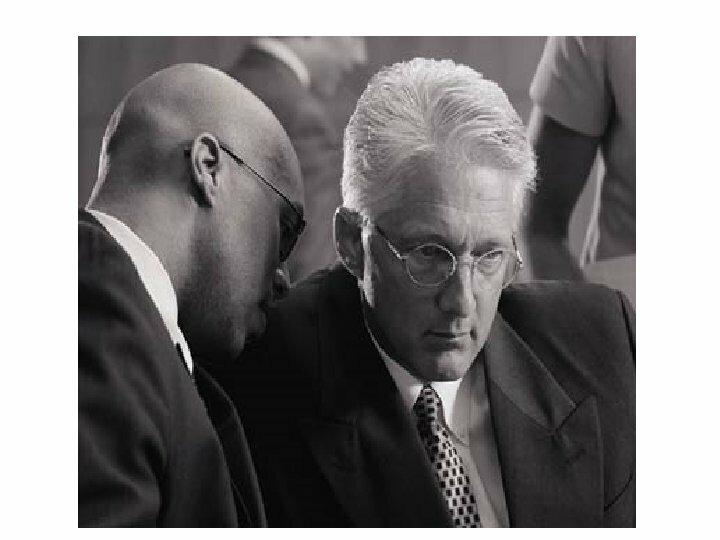 Attorney-Client Privilege • "The attorney-client privilege and the attorney work product protection serve an extremely important function in the American legal system. 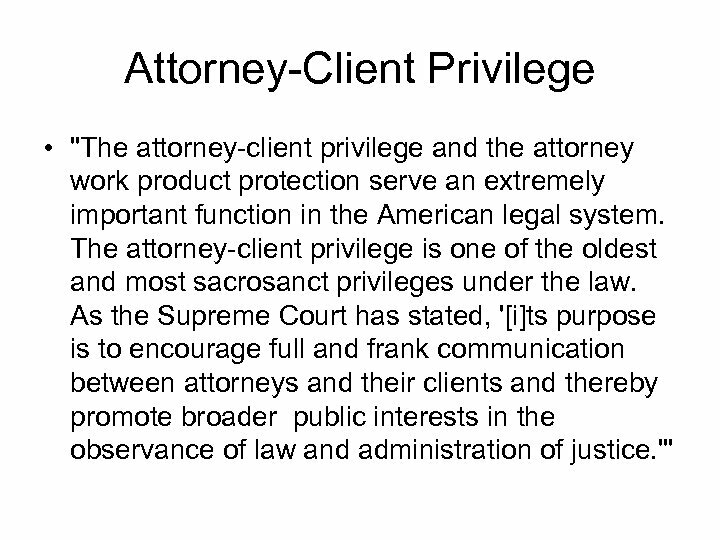 The attorney-client privilege is one of the oldest and most sacrosanct privileges under the law. As the Supreme Court has stated, '[i]ts purpose is to encourage full and frank communication between attorneys and their clients and thereby promote broader public interests in the observance of law and administration of justice. '" 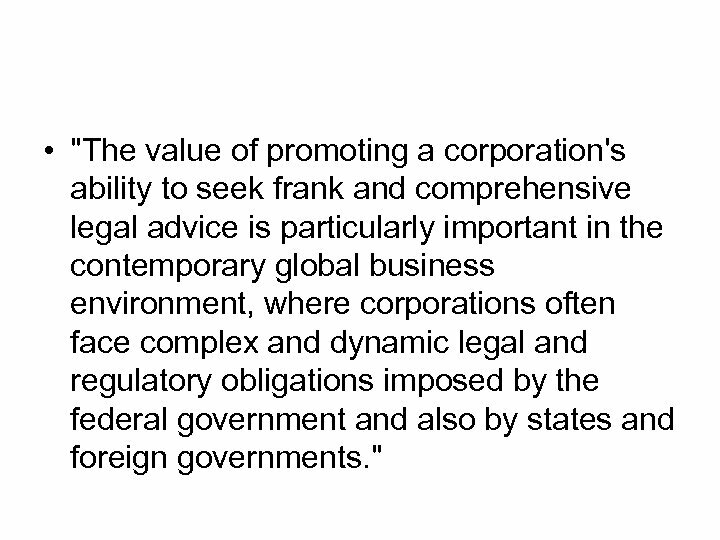 • "The value of promoting a corporation's ability to seek frank and comprehensive legal advice is particularly important in the contemporary global business environment, where corporations often face complex and dynamic legal and regulatory obligations imposed by the federal government and also by states and foreign governments. " Why Be Concerned? 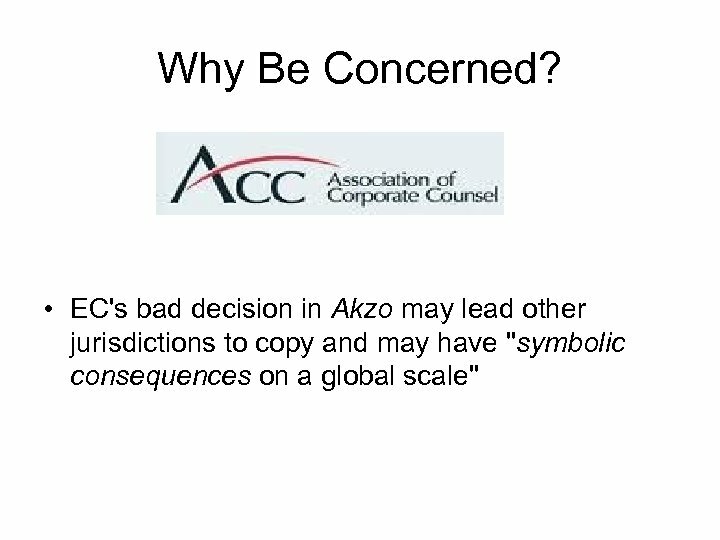 • EC's bad decision in Akzo may lead other jurisdictions to copy and may have "symbolic consequences on a global scale"
• Globalization -- Many U. S. companies have operations abroad. • Privileged communications exist in digital form, i. e. , they're everywhere. 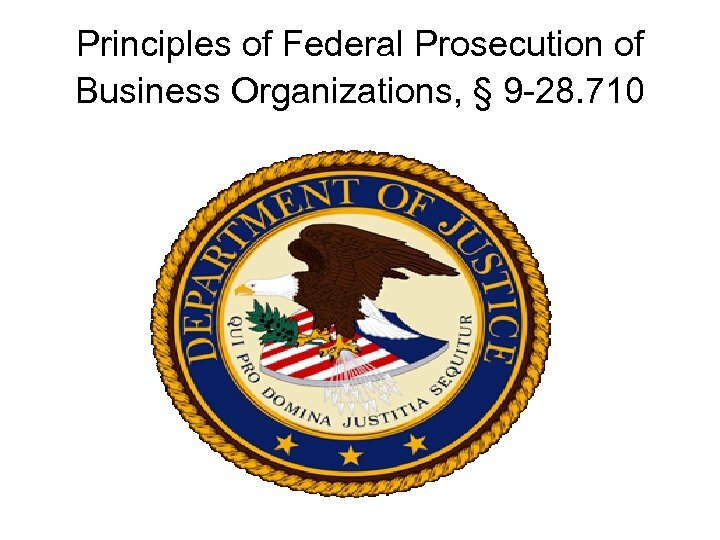 • Privileged documents seized by unfettered European investigators may be shared. • Wake-up call to fact that privilege determination may be made in unfriendly jurisdiction. Akzo. 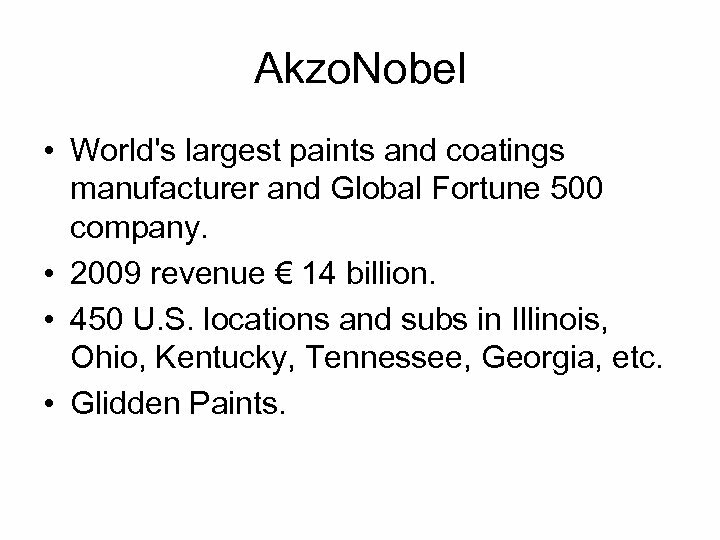 Nobel • World's largest paints and coatings manufacturer and Global Fortune 500 company. • 2009 revenue € 14 billion. • 450 U. S. locations and subs in Illinois, Ohio, Kentucky, Tennessee, Georgia, etc. • Glidden Paints. 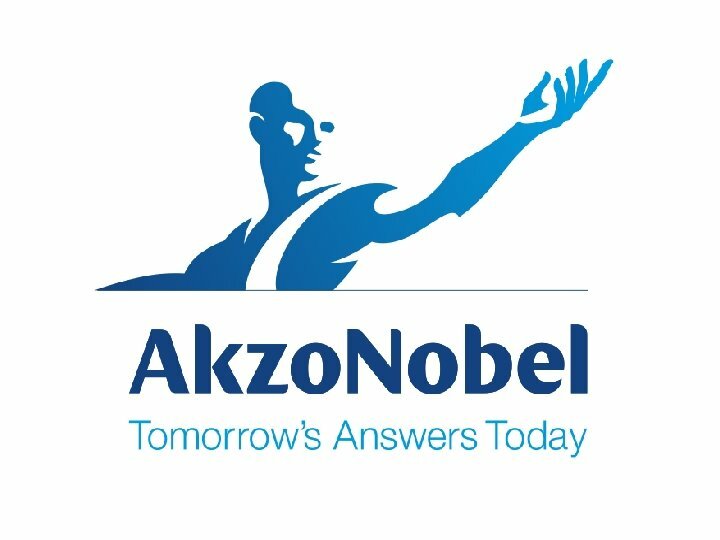 • February 2003 ex parte EC decision to investigate Akzo and one of its subs for possible anti-competitive practices. 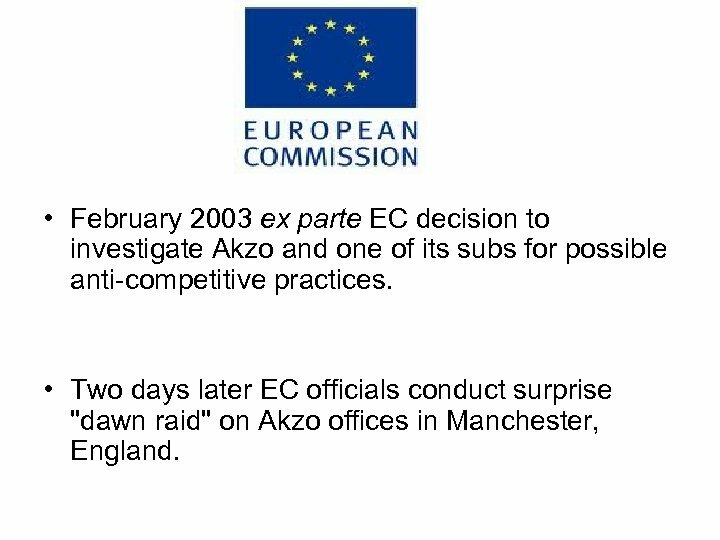 • Two days later EC officials conduct surprise "dawn raid" on Akzo offices in Manchester, England. EC Dawn Raids • 1. May enter premises unannounced. • 2. 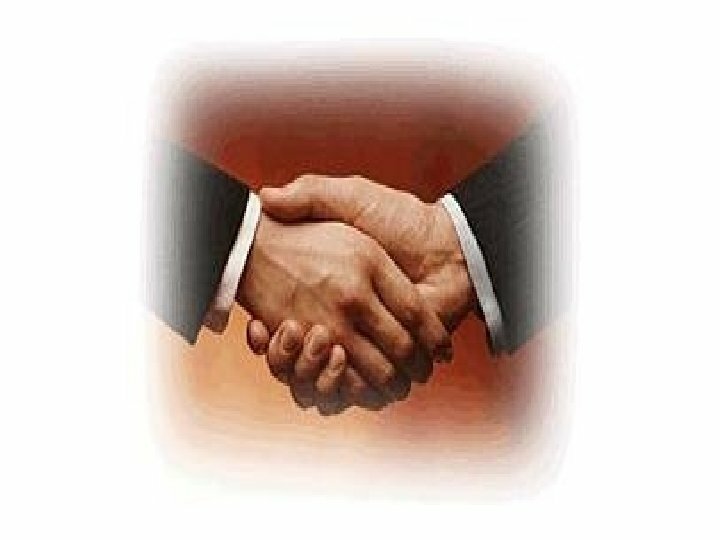 May examine and copy business records. • 3. May seal any portion of premises or records. • 4. May ask questions with penalties for failure to answer correctly and truthfully. 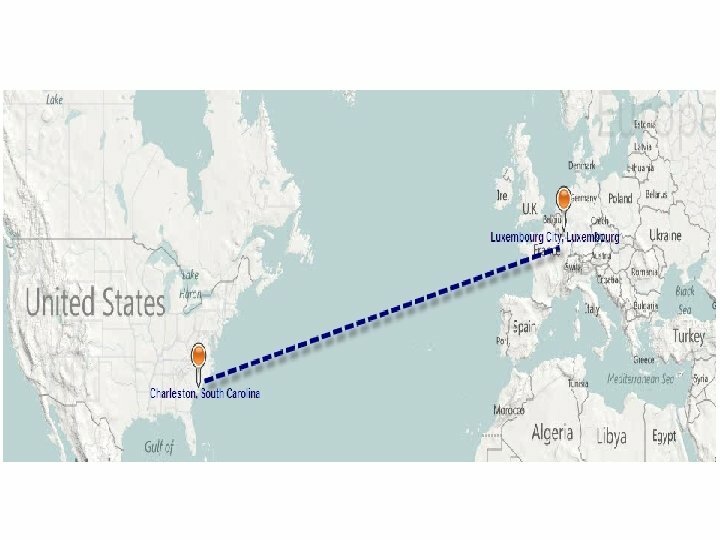 Akzo Raid Lasted Two Days • Akzo claimed privilege on 2 e-mails exchanged between its general manager and an in-house lawyer who was member Netherlands Bar. 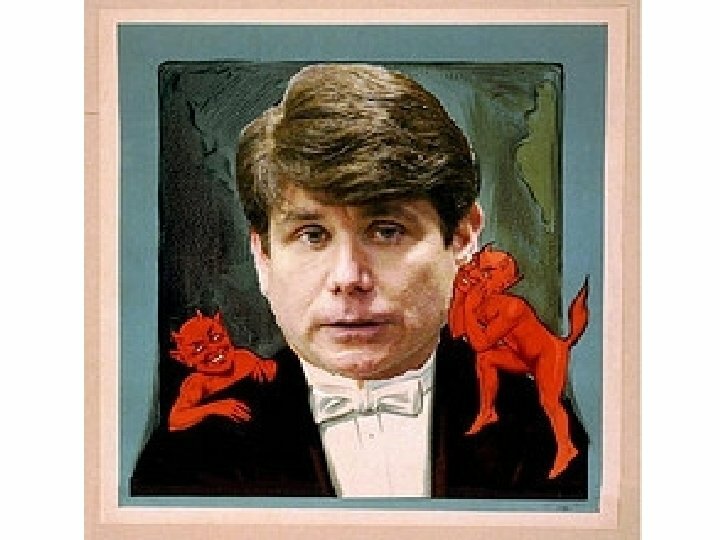 • Investigating team decided on the spot not privileged and seized e-mails. 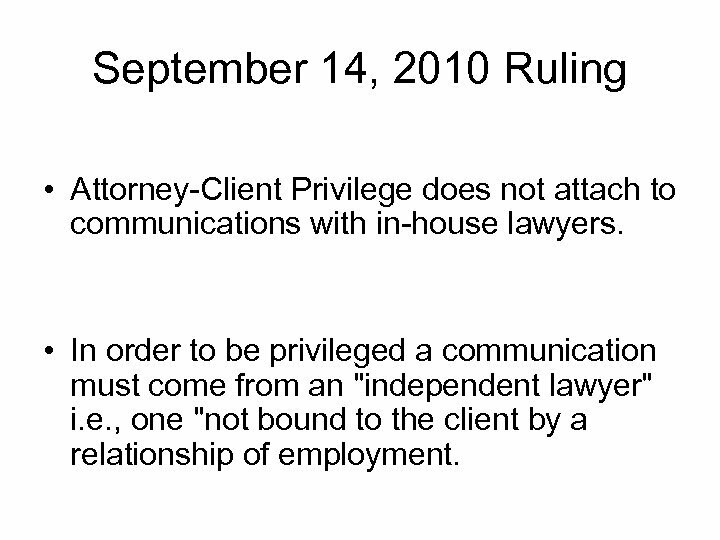 September 14, 2010 Ruling • Attorney-Client Privilege does not attach to communications with in-house lawyers. 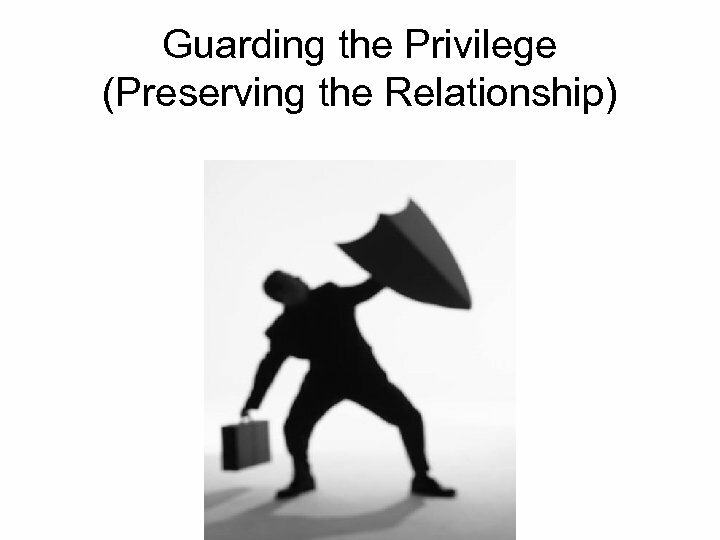 • In order to be privileged a communication must come from an "independent lawyer" i. e. , one "not bound to the client by a relationship of employment. 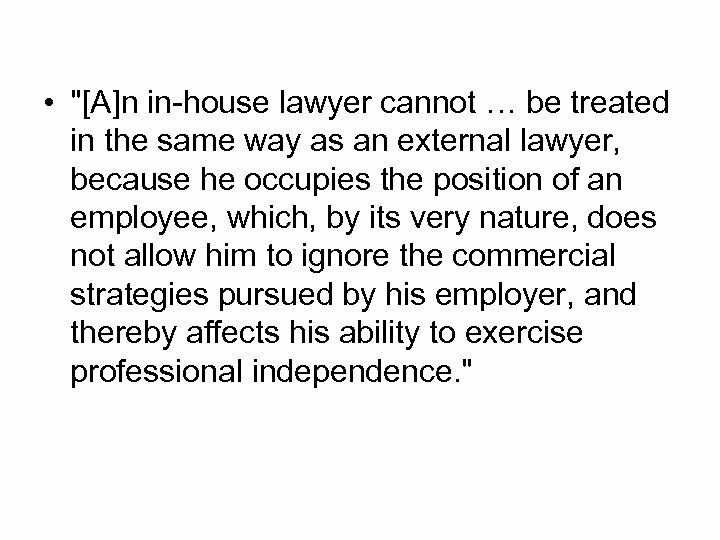 • "[A]n in-house lawyer cannot … be treated in the same way as an external lawyer, because he occupies the position of an employee, which, by its very nature, does not allow him to ignore the commercial strategies pursued by his employer, and thereby affects his ability to exercise professional independence. " 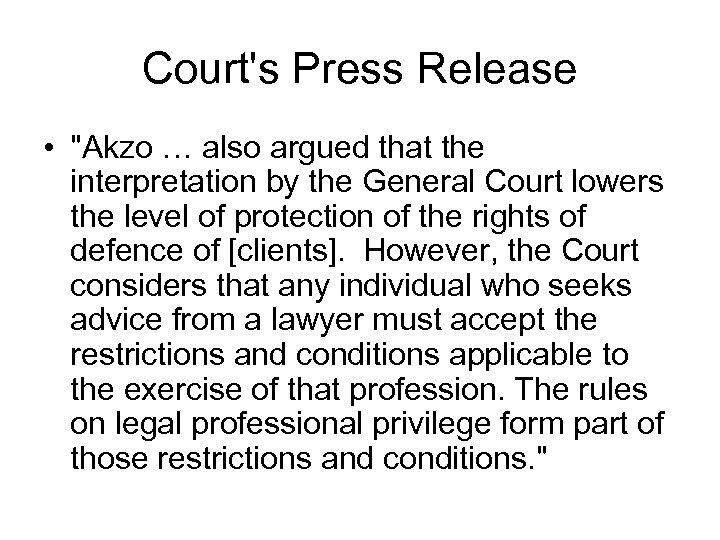 Court's Press Release • "Akzo … also argued that the interpretation by the General Court lowers the level of protection of the rights of defence of [clients]. 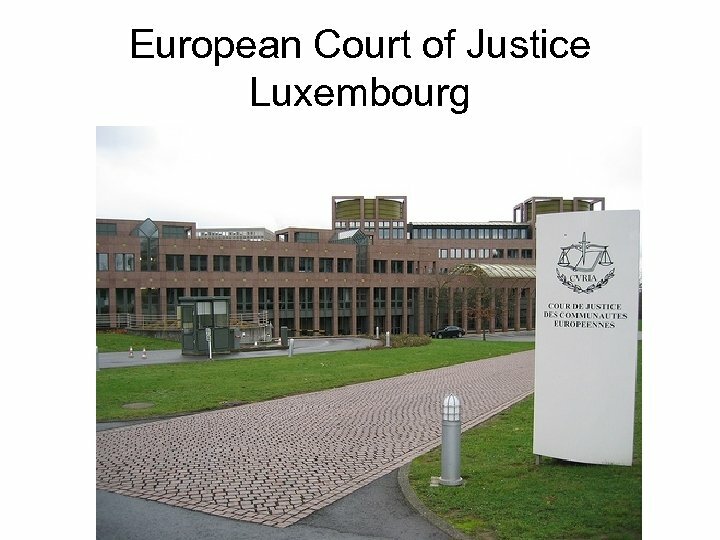 However, the Court considers that any individual who seeks advice from a lawyer must accept the restrictions and conditions applicable to the exercise of that profession. 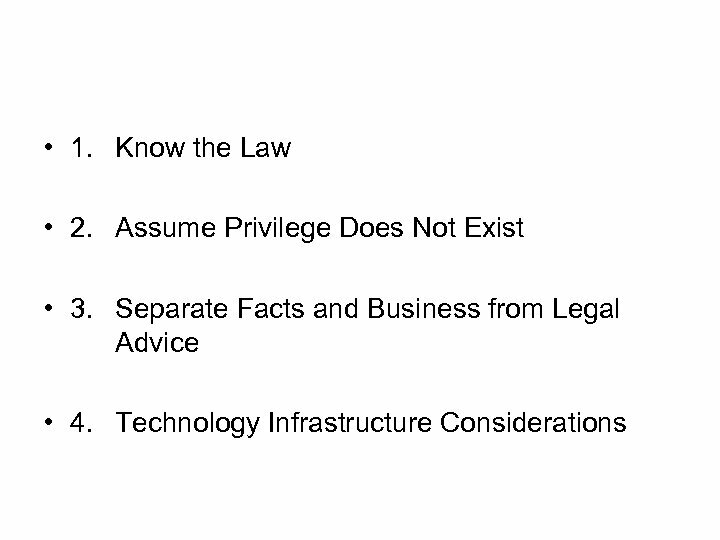 The rules on legal professional privilege form part of those restrictions and conditions. " In Other Words …. 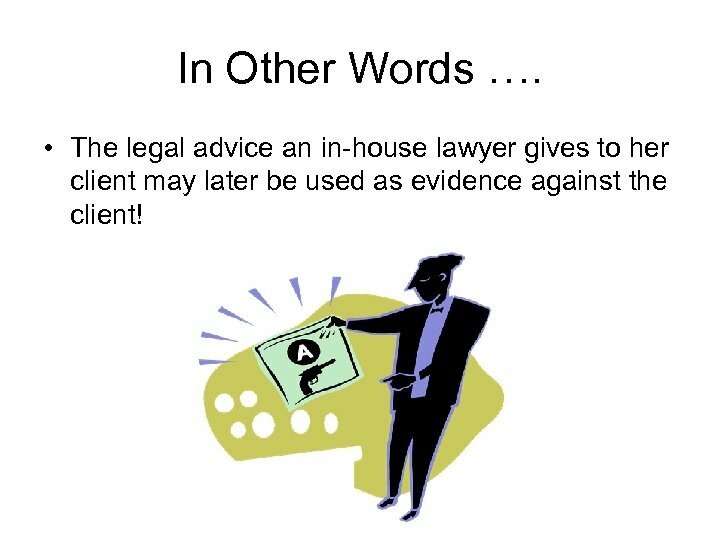 • The legal advice an in-house lawyer gives to her client may later be used as evidence against the client! 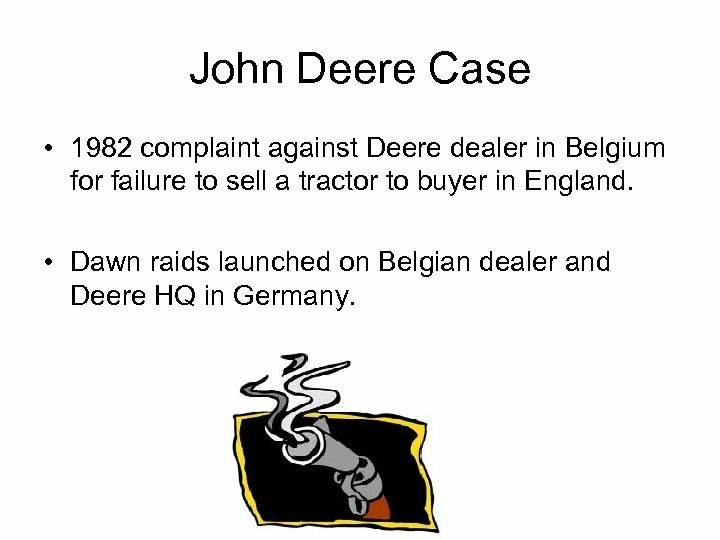 John Deere Case • 1982 complaint against Deere dealer in Belgium for failure to sell a tractor to buyer in England. 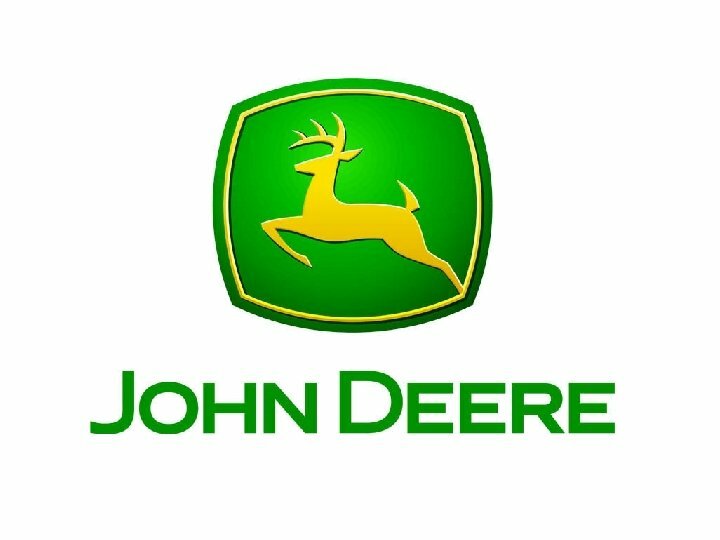 • Dawn raids launched on Belgian dealer and Deere HQ in Germany. 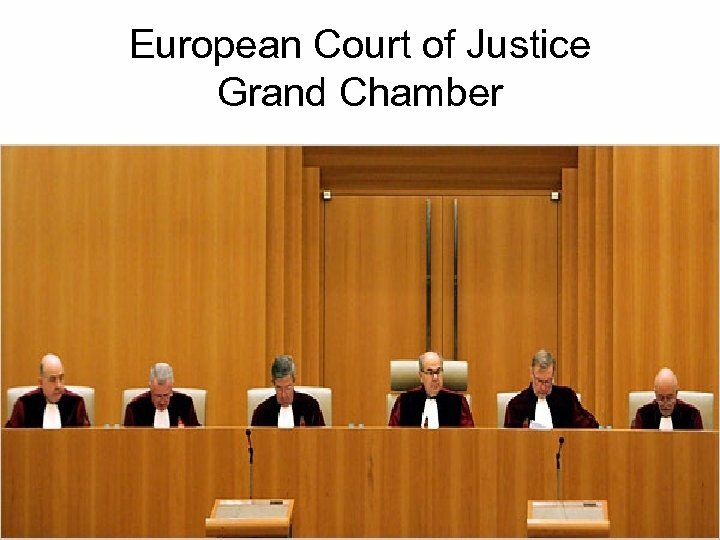 • Memo from U. S. General Counsel to managers in Europe expressing his opinion that policies may violate EU law. 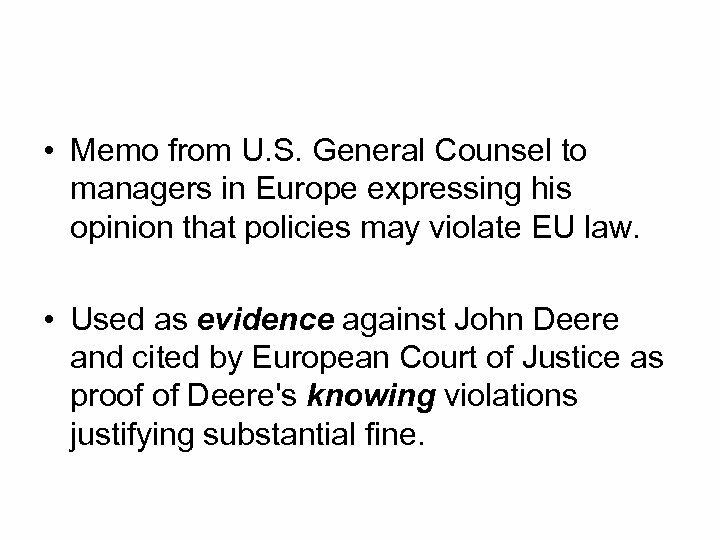 • Used as evidence against John Deere and cited by European Court of Justice as proof of Deere's knowing violations justifying substantial fine. • 5. 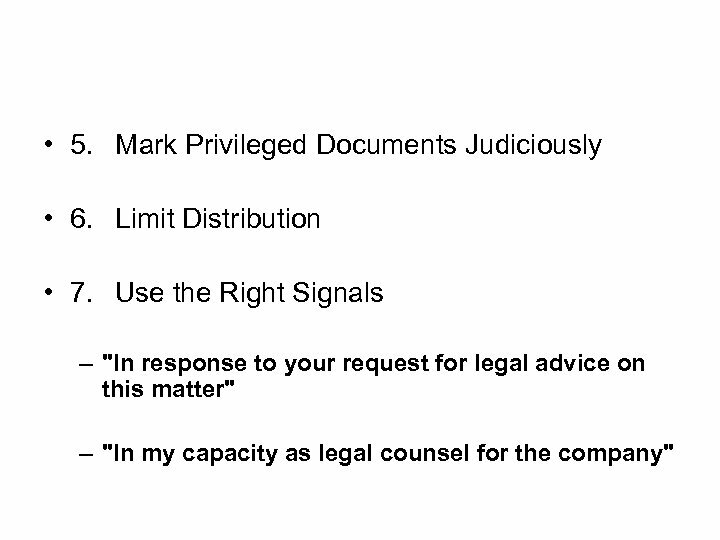 Mark Privileged Documents Judiciously • 6. Limit Distribution • 7. 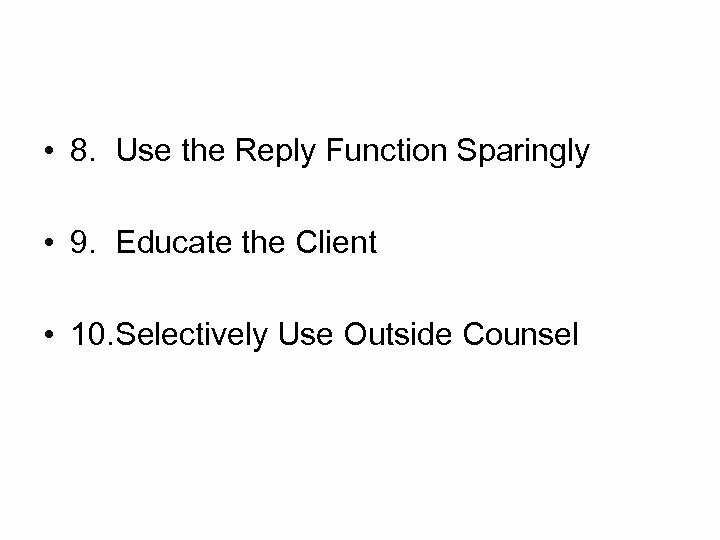 Use the Right Signals – "In response to your request for legal advice on this matter" – "In my capacity as legal counsel for the company"